1899: Built at Arnside for Richard Woodhouse, Euston Rd, Morecambe. 24.14.1903: Sold to Jeffrey Wright, 73 Kemp St Fleetwood. 14.07.1903: Registered at Fleetwood (FD206). 08.07.1908: Sold to Thomas Cuthbert Hornby, 57 Blackiston St, Fleetwood. Skippered by Thomas Tomlinson. 17.10.1908: Sold to Alexander Rawcliffe of 126 Victoria St, Fleetwood and skippered by Ernest Railton and Joseph Rawcliffe. 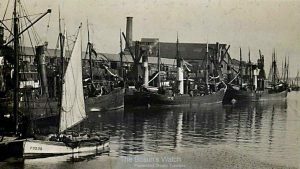 28.12.1918: Fleetwood registration cancelled, boat having been transferred to Barrow. 18.05.1921: Boat sold to ?? ?? Fleetwood and Barrow registration cancelled. 19.06.1921: Registered at Fleetwood (FD388). This entry was posted in Sailing Trawlers on November 17, 2016 by Fred Smith. 7.12.1903 Sold and and owned by J. Wilson Jnr. She changed owners again on 21.7.1916, again on 30.5.1917 and yet again on 21.11.1917. Sold again on 26.6.1919. 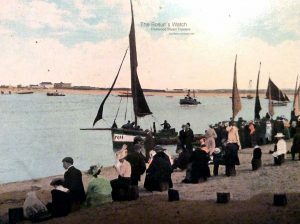 19.06.1920: Fleetwood registry closed on transfer to Whitehaven registry. This entry was posted in Sailing Trawlers on November 1, 2016 by Fred Smith. sv Martha and Lizzie – FD?? 1874: Completed by David Banks Jnr & Co, Queen Anne’s Battery, Plymouth as MARTHA AND LIZZIE. Registered at Fleetwood (No.7/1974). Owned by William Thompson, Blackburn. 4.8.1874: Sailed Fleetwood at 1.00pm. for the fishing grounds off Morecambe Bay (Sk. Robert Rimmer); five crew all told. 5.8.1874: On the ‘oyster beds’ some nine miles NNW of Morecambe Bay Lightship in company with other trawlers including CYGNET (FD110), EZRA (FD1) (Sk. Richard Wright) and MARY ASHCROFT (FD?? ), with the trawl down in a moderate SW breeze under main and jib running across the tide. At about 6.00pm. when hauling the net saw a ship under full sail on the port tack coming towards them. Hauled the jib sheet to get clear of the vessel and sailed away about two miles before letting go the net again. An hour later trawling on the port tack, saw the same ship again bearing down on them now on the starboard tack. When it became obvious that the ship would not pass clear, paid out about five or six fathoms of trawl rope to head the smack. When close shouted to the ship to bear away or luff up, but saw no one onboard. The MARTHA AND LIZZIE was struck amidships and went down under the ship’s bow. 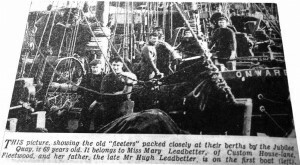 Three men, David Cowell, George Cowell and Edward Rimmer, were able to get hold of the chain cable and scramble onboard the ship assisted by a crew member, leaving two men struggling in the water. David Cowell asked Capt Austen to lower a boat, but Murphy, the channel pilot, said he had seen the two men go down. After wearing ship, payed off on the port tack and when in a position close to where the collision had occurred, saw a boat belonging to the CYGNET searching. After wearing ship again transferred the survivors to the boat. 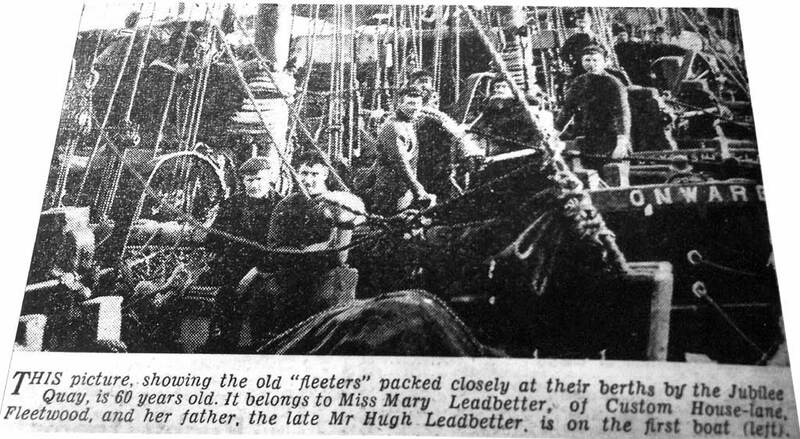 They were initially placed onboard the MARY ASHCROFT but later taken to Fleetwood onboard the CYGNET. Robert Rimmer and fisherman David Cowell were drowned. The ship proved to be the American ship IRONSIDES (1400grt/) (Capt. George Blackstone Ashton), Liverpool for New York with general cargo. 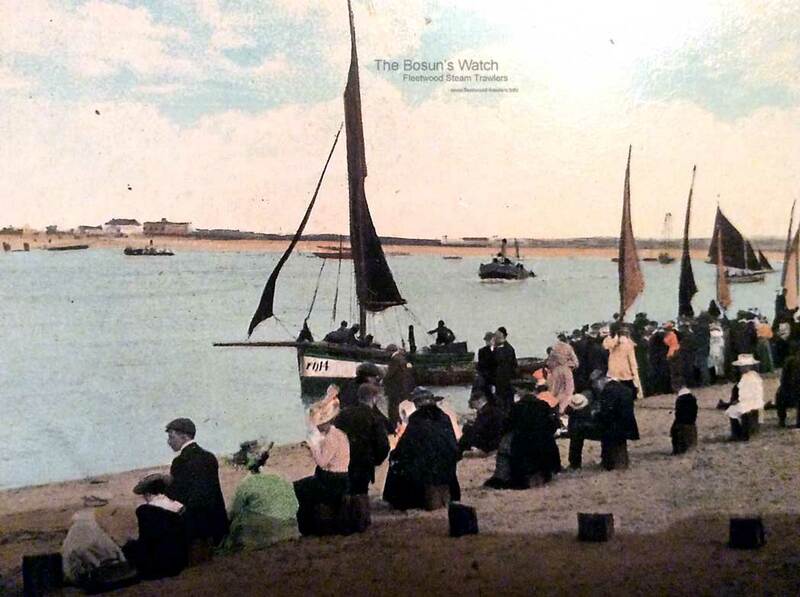 27.8.1875: Body of Robert Rimmer recovered by John Wilson, fisherman, some few miles NW of Morecambe Bay Lightship. 25.12.1874: At Liverpool, Capt Ashton was arrested on a charge of manslaughter and taken to Kirkham to await trial. 19.1.1875: At Blackpool Police Court, Capt Ashton was charged on remand with running down a fishing smack and causing the death of two men. The prosecution alleged that the captain did not do his best to save the men. The case was adjourned for one week. 25.1.1875: At Poulton Petty Sessions Capt Ashton was committed for trial at the next Lancaster Assizes. 11.3.1875: At Lancaster Assizes Capt Ashton found not guilty, by direction of the judge, on the grounds that he was an American subject on board an American registered vessel and not subject to the jurisdiction of the Queen and therefore the case could not be supported. This entry was posted in Lost Vessels, Sailing Trawlers on October 30, 2016 by Fred Smith.